Gigabyte's 802.11ac/a/g/n, 2x2, dual-band Wi-Fi + Bluetooth 4.2 PCI Express card packs a big punch on a small card and offers Wi-Fi throughput of up to 867 Mbps. 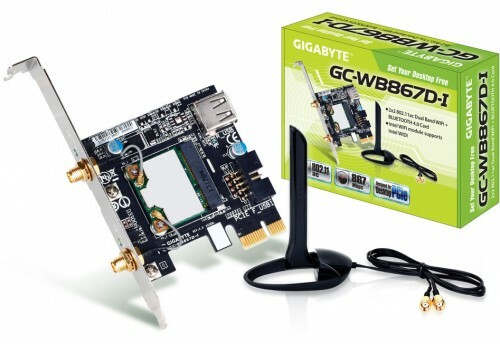 The Gigabyte GC-WB867D-I delivers dramatically faster Wi-Fi speeds (up to 867 Mbps) than 802.11n, with more bandwidth per stream (433 Mbps), more capacity for more users (extended channel bonding 80MHz) and a broader coverage and better battery life (more data transmit efficiencies reduce power consumption). The card also features Intel Wireless Display which lets you enjoy wireless life at home or at work. Using adapters, you can easily experience a PC on your TV or projectors, Broadcasting Promotion and commercials with more flexibility and efficiency. For more information, please visit Intel's website. 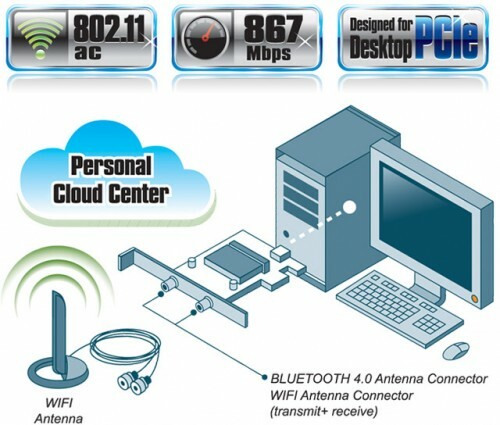 There is also support for the latest Bluetooth 4.2 and IEEE 802.11ac Wi-Fi connectivity. The Bluetooth 4.2 standard features sync data quickly and reliably that is up to 2.5x faster with a huge packet capacity increase – nearly 10x more versus previous versions. This means that transferring important content from your smart phone or tablet is easier and faster than ever.